The talent and skills of violinist/bandleader Regina Carter are limitless. She has been a dynamic force on the violin since her early days with the Detroit band Straight Ahead. Her solo projects have been impeccable, each taking her to a higher level of musicianship and artistry. Her current project, Paganini: After a Dream sores to unimaginable heights. The vision for this project began in September 2001 when pianist Werner “Vana” Gierig played a rehearsal CD of her quintet for his longtime friend Andrea Liberovici, an Italian composer and theatre director. This inspired the idea of Regina playing a jazz concert with the Paganini violin. “The Cannon” (II Cannone) – nicknamed for its enormous natural sound, was built in 1743 by Guarneri del Gesu and belonged to the great baroque violinist and improviser, Nicolo Paganini. She would become the first non-classical violinist and the first African-American to play this illustrious instrument. Through faith, determination, and perseverance, Regina, Vana and Andrea worked diligently to make the vision of playing “The Cannon” a reality. In December 2001, their vision came to life with a spectacular concert in Genoa, Italy for which Regina received several standing ovations. After the success of the concert and additional negotiations with the Italian officials, they came back to Genoa in November 2002 to record an album on this magnificent instrument. Regina chose music from the French Impressionist period for this album. Many of the impressionists hung out with jazz musicians during that time which lends to the rich quality and beauty of the music presented in this recording. Each piece is filled with passion beyond compare. Included are Ravel’s “Pavane Pour Une Infante Defunte“, Bonfa’s “Black Orpheus“, Faure’s “Pavane“, on which Regina melodically chants like rain falling on a desert, and “Apres Un Reve“, Piazzolla’s “Oblivion“, and Debussy’s “Reverie” which is based on an arrangement performed by Ella Fitzgerald. It is punctuated gracefully with the piano and cymbals. Pianist Werner “Vana” Gierig contributed “Healing in Foreign Lands” and there is an excerpt from “Alexandra” which Regina composed. This piece was originally commissioned by the John F. Kennedy Center for the Performing Arts. The album closes with Morricone’s “Cinema Paradiso” which opens like the beginning of a fairy tale and flows into playful bossa nova with a hint of Jobim toward the end. Joining Regina on this musical pilgrimage of a lifetime are Werner “Vana” Gierig on piano, Chris Lightcap on bass, Alvester Garnett on drums, and Mayra Casales on percussion with special guest Borislav Strulev on cello and orchestra conducted by Ettore Stratta. They compliment each other well and the result is this fine recording that is a delightful addition to your music collection. Regina performed earlier this summer for two sold-out nights at Yoshi’s in Oakland. We were treated to an incredible performance. Her band played together like a close knit family with a very tight yet free sound. In addition to her excellence on the violin, Regina displayed her talents as a percussionist and vocalist as she sang vibrant African chants or whistled like a gentle bird. The set included enchanting renditions of “Black Orpheus“, “Reverie“, “Oblivion“, and “Pavane Pour Une Infante Defunte” (Dance for a Dead Princess), “Pavane” and “Healing in Foreign Lands” from her current release. She opened up the violin on the playfully up-tempo “The Music Goes Round and Round” and Alvester Garnett provided some great brush work on the drums. On the bossa nova “Wise Little Cat” she opened by plucking the strings and later rhythmically clapping while holding her violin between her chin and shoulder. She swung brightly on “Prey Loot” from Detroit musician Lucky Thompson and “For Someone I Love” from vibraphone great Milt Jackson. She transformed the stage into a far away land on “Mandingo Street” with sounds, whistles, and chants. Mayra Cavales pulled out all the stops and played every percussion instrument imaginable to give the piece a full richness of the motherland. Werner “Vana” Gierig gave some marvelous piano solos throughout the evening as did Chris Lightcap on the bass. Regina silenced the room with her encore performance of “Spring Can Really Hang You Up The Most” (a personal favorite for me) as it pierced into our hearts. She was also outstanding on her encores of “Papa Was A Rolling Stone” and “Chattanooga Choo Choo.” She has the ability to play any kind of music exceeding well. Thank you for sharing your gifts. If you missed her this time at Yoshi’s, don’t worry for she will be back in April. This entry was posted on Saturday, September 6th, 2003 at 8:30 am. It is filed under Music Reviews. You can follow any responses to this entry through the RSS 2.0 feed. i really like her version of Papa Was a Rolling Stone with Cassandra Wilson. 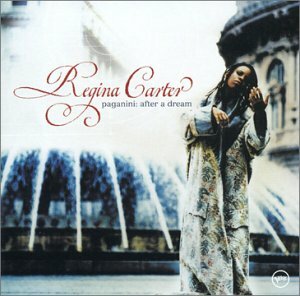 I would really appreciate it if someone could tell me where to get an mp3 of Pavane from Regina’s album Paganini:After a Dream. I have searched high and low and can’t find anything. Thank You.